Learn about the Cisco Nexus 3548 with Algo Boost from the experts. Algo Boost technology allows the Cisco Nexus 3548 to achieve exceptionally low latencies of 250 nanoseconds (ns) or less for all workloads -- unicast and multicast, and Layer 2 and 3 -- regardless of the features applied. Learn how Cisco's latest innovation delivers ultra-low latency and increased visibility. Our insightful blogger explains how the new Cisco Nexus 3548 changes the game. 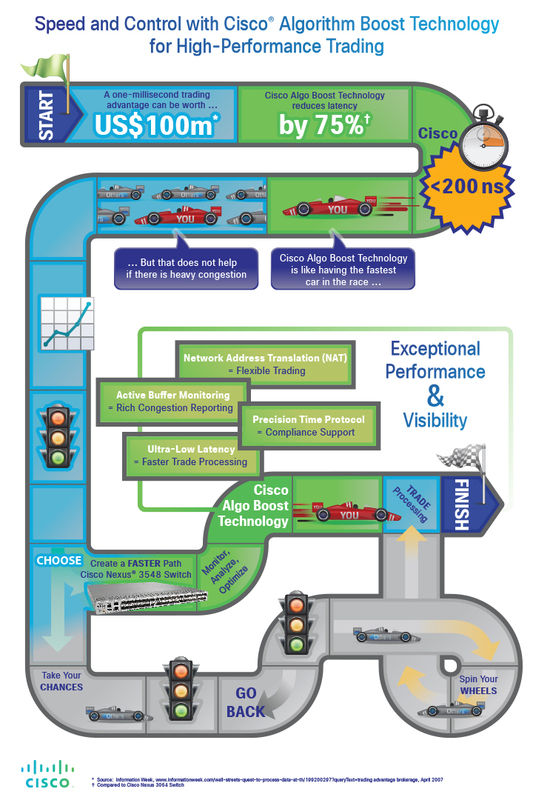 See the financial impact that the new Cisco Nexus 3548 with Algo Boost can make.